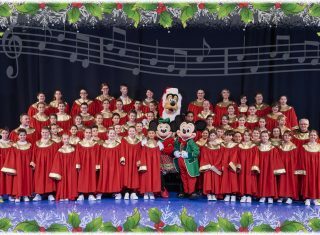 Disney Performing Arts Presents - Let's Sing Christmas! Book Now! Singing in a Winter Wonderland! As Disneyland® Paris is transformed into a winter wonderland, with dazzling decorations and even snowflakes falling on Main Street U.S.A®, why not enhance your trip further by taking part in Disney Performing Arts Presents – Let’s Sing Christmas?! This Christmas at Disneyland® Paris, a brand new musical show will take place in Videopolis Theatre. We invite your choir or vocal group to join Mickey to be part of an unforgettable once in a lifetime experience, singing the Magic of Christmas at Disneyland® Paris. Legend tells that the power of uniting voices from around the world, is strong enough to light the brightest Christmas star! A mix of Disney Characters, Disney professional singers, a unique performance venue and technical wonderment, will all create this magical event. A vocal workshop prior to the performance will give the chosen choirs an unforgettable glimpse into the world of entertainment at Disneyland® Paris! Please contact a member of our Disney Team for more information on how to apply! Due to the limited number of performance slots and accommodation packages, applications will be accepted on a first come, first served basis. Make your way to Disneyland® Paris and check into your chosen hotel. Depending upon your arrival time, you will be able to enter the Disney Parks and experience some of the attractions, parades & shows. Prior to your performance, your choir will take part in a vocal workshop with professional artists and a Disney Performing Arts coach. This is a once in a lifetime opportunity to work with Disney performers in the heart of the magic! There will be 2 mass choir performances scheduled each day and depending upon the number of performers, choirs will have the opportunity to perform in 1 or 2 shows over the 2 days but should be ready to perform in both shows each day if the opportunity arises. Between shows your choir will have plenty of time to experience the magic of both Disneyland® Paris Parks. Say ‘Au Revoir’ to Disneyland® Paris, check out of the hotel and travel home with magical memories to last a lifetime. Inspired by the Disney•Pixar movie ‘Cars’, Disney’s Hotel Santa Fe is a vibrant and fun hotel. This New Mexico themed hotel is perfect for anybody looking for a comfortable stay as well as great value for money. Located just a 20 minute walk away or a couple of minutes via free shuttle bus from the Disney® Parks, you will never be far from the magic! The bright rooms feature decor inspired by the movie ‘Cars’ and can sleep up to a maximum of 4 people per room in 2 double beds plus 1 infant sleeping in a cot. Disney’s Hotel Santa Fe is also home to a colourful bar and a buffet restaurant that serves Tex-Mex and international fare. Guests can also take advantage of Extra Magic Time when selected attractions open one hour earlier, exclusive to people staying at a Disney Hotel. Get a taste of the Old West at Disney’s Hotel Cheyenne. There’s a whole frontier town ready to explore with a saloon, shop, restaurant and outdoor areas all full of the Western charm. Located only a 20 minute walk away or couple of minutes via free shuttle bus from the Parks, you’ll never be far from the magic! Having been recently refurbished, the Toy Story inspired standard rooms at Disney’s Hotel Cheyenne can sleep up to a maximum of 4 guests in either 2 double beds or 1 double bed, 1 single bed and 1 pull out bed plus 1 infant sleeping in a cot per room. Grab a bite to eat at the Chuck Wagon buffet restaurant or kick back and enjoy a drink at the Red Garter Saloon. Guests can also take advantage of Extra Magic Time when selected attractions open one hour earlier, exclusive to people staying at a Disney Hotel. At Disney’s Sequoia Lodge, experience nature in all her majesty. This 3-star hotel is inspired by the Great National Parks of America and if you love the great outdoors, you’ll feel right at home. Situated right next to Lake Disney, the hotel is only a 10-15 minute walk away or couple of minutes via shuttle bus from the Park, meaning you’re never far from the magic! Rooms can sleep up to a maximum of 4 guests per room in 2 double beds plus 1 infant sleeping in a cot. There’s a cosy and relaxing bar where you can enjoy drinks around a flickering fireplace, and a restaurant offering an all-you-can-eat buffet of international dishes. You can also unwind by enjoying walks amongst the trees and around the lake or take a swim in the indoor and outdoor pools. Guests can also take advantage of Extra Magic Time when selected attractions open one hour earlier, exclusive to people staying at a Disney Hotel. Due to the limited number of performance slots and accommodation packages, applications will be accepted on a first come first served basis. Standard Disney Performing Arts application documents should be completed and sent within the regular timelines (at the latest 12 weeks prior to their requested performance date). Audition repertoire will be specific to this event – each group is required to send 2 full non-religious Christmas songs, the rest of our audition criteria remains unchanged & should feature at least 90% of those performers requesting to perform. There will be up to 2 shows scheduled on each date, potentially made up of choirs from multiple groups. Each show will feature a maximum of 100 performers. Depending on the number of confirmations, groups may have the opportunity to perform in 1 or 2 shows per day over the 2 days, but should be ready to perform in both shows each day if the opportunity opens up. Show times will be confirmed at a later date & may be scheduled at any time of the day. Specially commissioned Disney repertoire will be used for the performances. Following confirmation, all accepted groups will receive the pieces and will be required to learn everything for their respective show date. 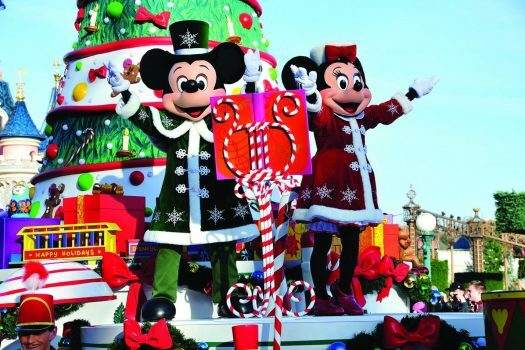 Performers are required to wear black bottoms, black tops & black closed toed footwear, with no visible logos – Christmas coloured capes/gowns will be provided by Disney for all performers to wear during the show. 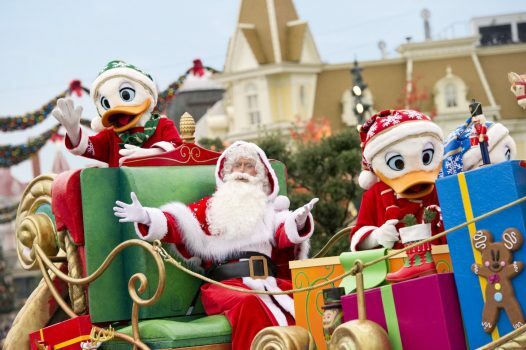 Transport is not included in the above package but we can provide prices for the Eurostar train from London St Pancras, Ebbsfleet International or Ashford International to Disneyland® Paris. Alternatively we can source flights from your local airport or book an executive coach from your home town. Please enquire for more details. Prices available upon request depending upon preferred arrival date, package and hotel – please contact us for more details. The choir must have at least 10 performers aged 7 years and over. In order to perform the choir must submit an audition for approval by Disney Performing Arts. If you would like a quote for your travel insurance please contact us. Shows, parades and events are subject to change, postponement or cancellation without prior notice, particularly in the event of bad weather. Picture is for illustrative purposes only. ©Disney. Greatdays Holidays Limited are a member of ABTA (Y0380) which means you have the benefit of ABTA's assistance and Code of Conduct. Please ask us to confirm what protection may apply to your booking. Greatdays Holidays Limited has an ATOL licence (4279) and all of our air package tours are protected under this licence. In the unlikely event of our insolvency, the Civil Aviation Authority will ensure that you are not stranded abroad and will arrange to refund any monies you have paid to us for an advance booking. All the flights and flight-inclusive holidays on this tour are financially protected by the ATOL scheme. When you pay you will be supplied with an ATOL Certificate. Please ask for it and check to ensure that everything you booked (flights, hotels and other services) is listed on it. Please see our booking conditions for further information or for more information about financial protection and the ATOL Certificate go to: www.atol.org.uk/ATOLCertificate.